The Busatti family has been weaving in the cellars of the Palazzo Morgalanti in Anghiari, Tuscany, since 1842. The first wool carding machines were dated from the late 1700s to early 1800s when the Napoleonic troops decided to produce uniforms for the Grand Army after the French invasion. To dye them blue they started cultivating guado, a plant in the brasicca family, known since Piero della Francesca, who used it to paint his frescoes. The machines were originally steam powered. They were electrified in the 1930s by Livio Busatti when the company took its current look and structure. 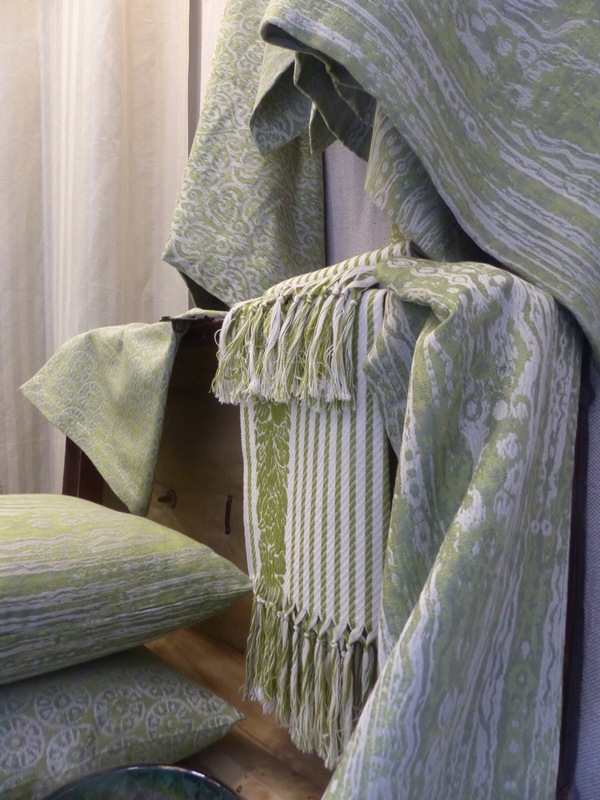 Busatti produce exquisite textiles in linen and cotton which they turn into tablecloths, curtains, bath towels and more stunning things for your home. 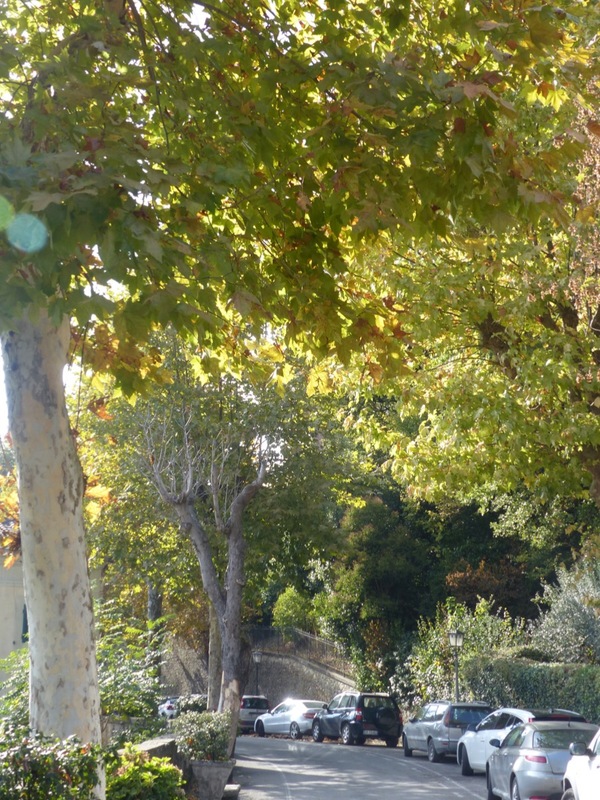 I set off to find Busatti headquarters in Anghiari on a cold, blustery autumn day. Doors and windows were firmly shut against the bitter wind. 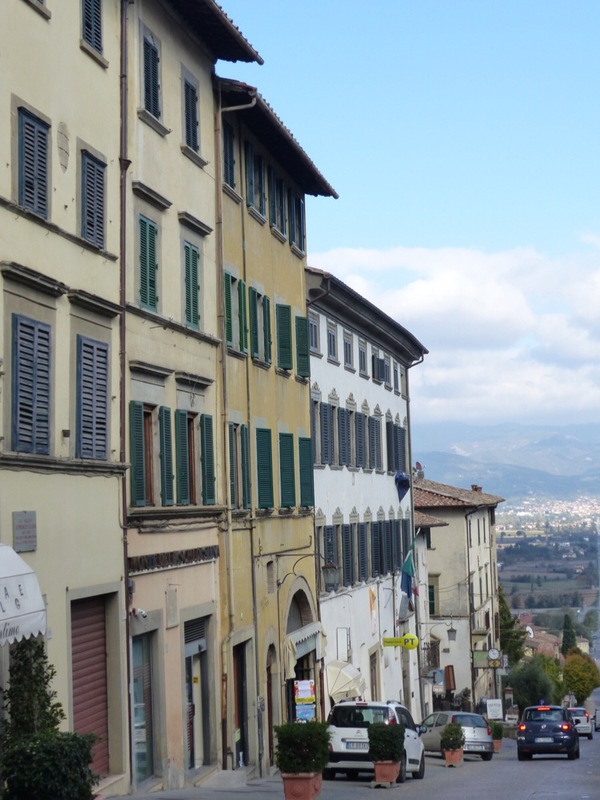 Like many Tuscan towns Anghiari sits proudly on top of a hill. I parked just outside the town centre and walked up the hill and through the impressive portal half way up the steep slope. Just inside I came upon “the straight street”. 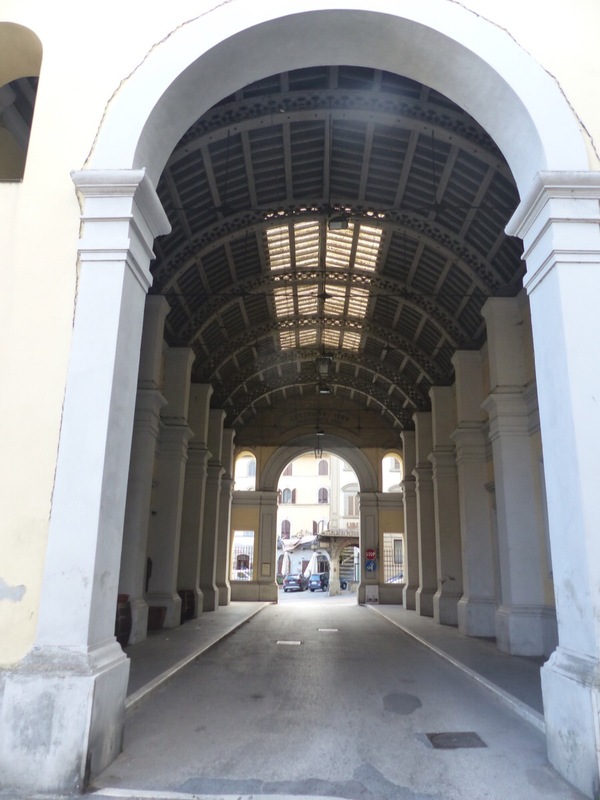 Corso Giacomo Matteotti was commissioned by Pier Saccone Tarlati in 1321. 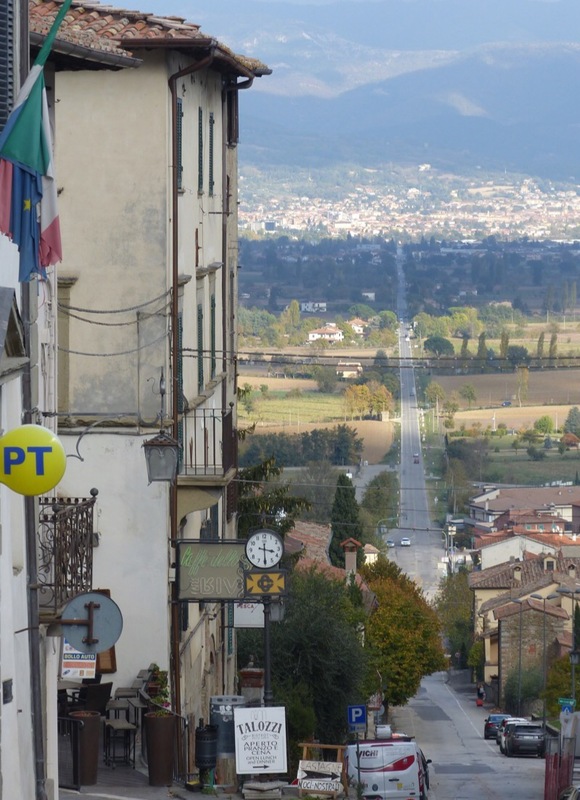 It is a 7 kilometre road that connects Anghiari to Sansepolcro and has always been a communication and trade route for the valley. On 29th of June 1440 it witnessed the battle of Anghiari and from the following year onwards the competition called Palio della Vittoria ( to celebrate the victory of Florence) has been held along the Croce. Today the Palio is still run on foot from the Maesta di Santa Maria alla Vittoria to Piazza Baldaccio Bruni. 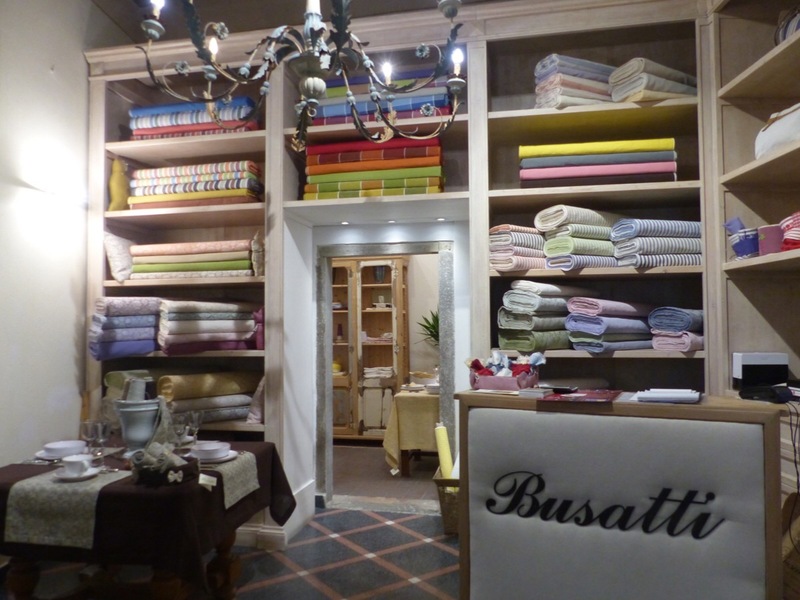 I found the Busatti showroom nearby and went in to admire their treasures. I have collected several pieces over the years and I love them. I did add to my collection. It is possible to do a tour of the weaving facility…another day. It was much too cold and windy to discover the delights of Anghiari but I will return on a better day. The town looked charming despite the bleak day. 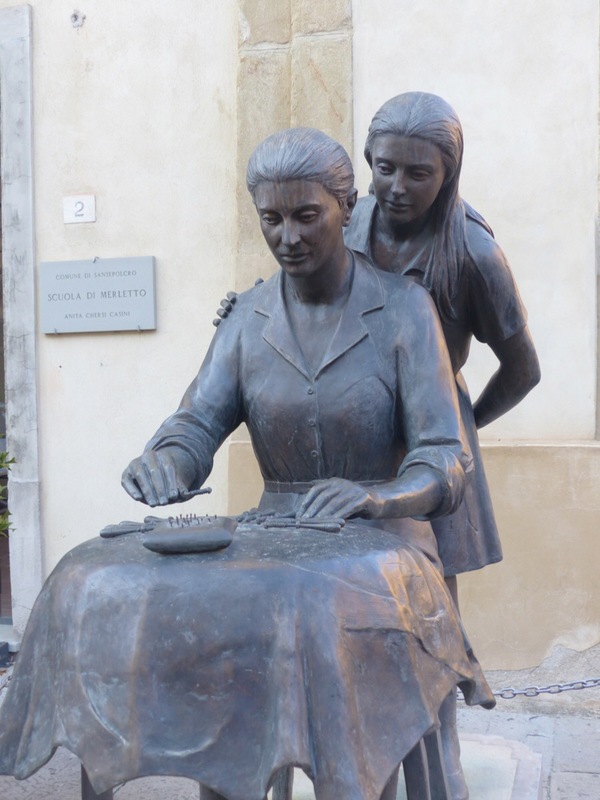 I returned to Sansepolcro where I had chosen to stay the night. It too was shuttered against the wind but there is much to see in this lovely town. A return visit is required. I passed a school and museum dedicated to lacemaking and embroidery. I would love to have gone in, but it was closed. Nearby was the home of Piero della Francesca, the early Renaissance painter. (1415-1492) He is famous for his magnificent frescoes. 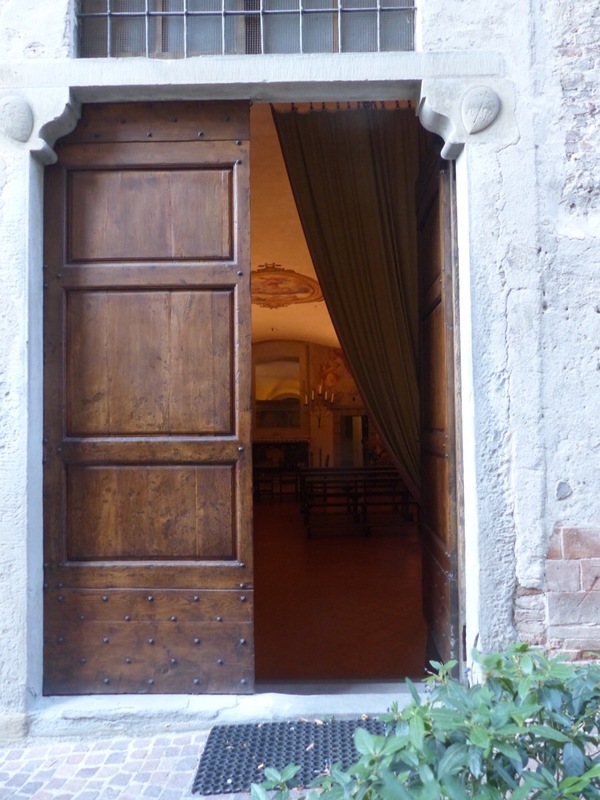 His History of the True Cross is in Arezzo at the church of San Francesco. His house was closed, but I could peer in through the glass door. I found an open door and went into the Oratory of the Holy Sepulchre. The date above the door was 1596. 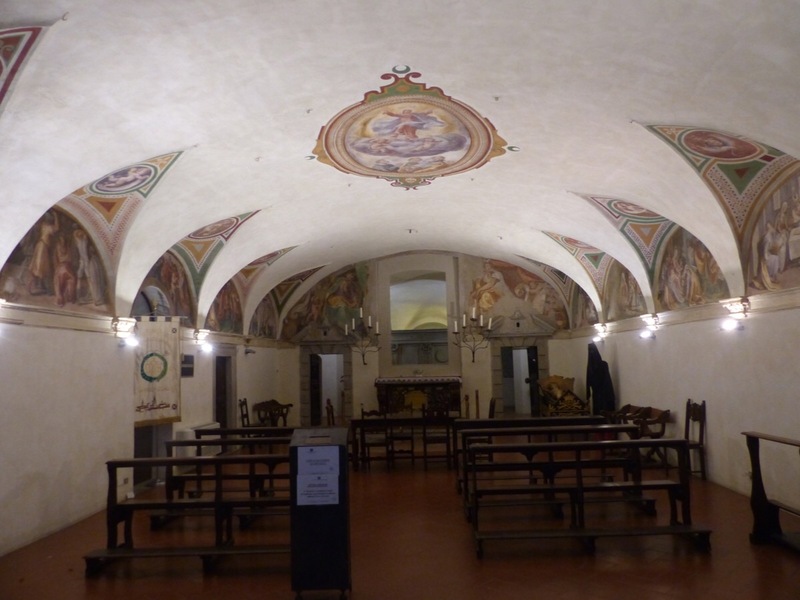 The lovely frescoes inside were painted by the 3 sons of Alberto Alberti. To my delight I found another Busatti shop! Of course I went in and found lots of different items. Their range is huge. It is possible to find small selections of Busatti in shops all over Italy, but it is great to find these dedicated shops that show a broad range. 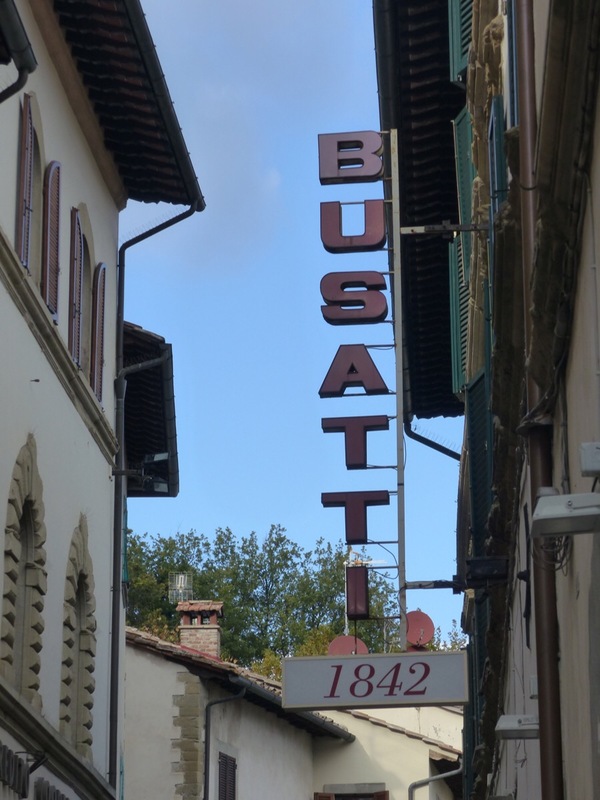 Busatti is a member of Italian Historical Business, an association born in Florence that gathers business with exceptional tradition and history. 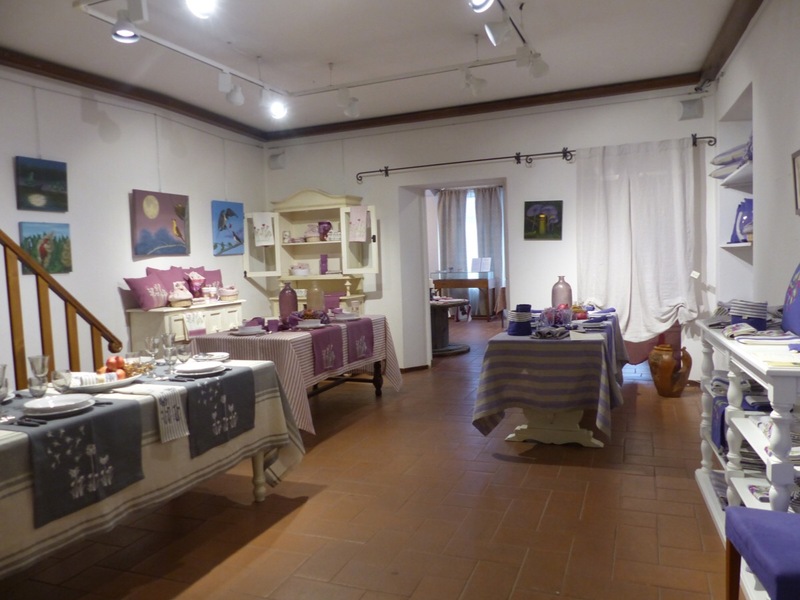 The Busatti shop and showroom in Anghiari is at 14 Via Mazzini. The Sansepolcro shop is at 48a Via Piero della Francesca. There is also a shop in Arezzo at 48 Via Corso. It is wonderful to see that they have been able to survive and still produce wonderful textiles which are appreciated by a sophisticated clientele. So much of the Italian textile industry has disappeared! Bagni di Lucca was a renown producer and weaver of silk until the Chinese made their business unviable. Next door to our mill we can see the ruins of one of their silk factories. They used to employ many locals. 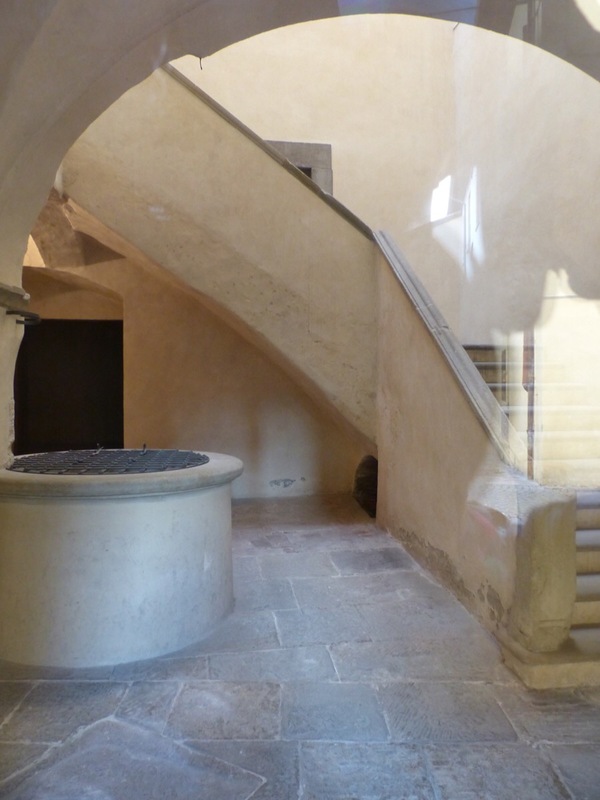 All that is gone…..
What a shame the industry has disappeared from Bagni di Lucca! Lucca was also a centre for textiles, but there is nothing left. I love the Langhe! It’s time for another visit. There is a never ending supply of great things to discover in Italy. I love Arezzo. It is one of my favourite towns to visit. 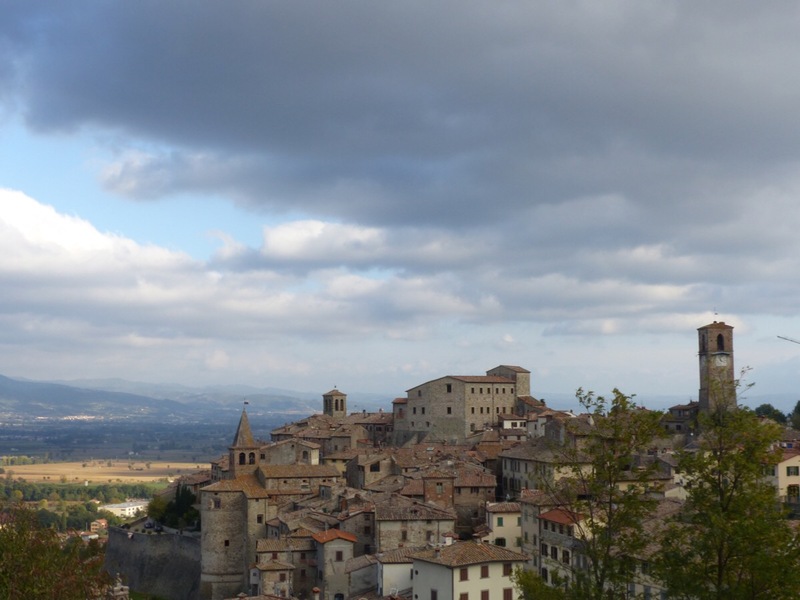 I will definitley return to Anghiari to explore a bit more. Debra, Thanks for your informative post. The production cellars of Busatti are well worth a return visit. Don’t forget to ask them if you can rummage in their mounds of offcuts which you can buy for a ridiculously low price. Great for seamstresses like you. Guado is woad in English. On my Tastes & Textiles: Woad & Wool tour in September I take guests to the Marche to dye with woad, we come north to Anghiari and Sansepolcro and north again to Stia in the Casentino. It was a horrible day when I visited. I don’t mind cold in the least, but the wind almost blew me off the hill. On top of that I was sneezing violently and could not wait to get inside to a warm bed! I will definitley return to explore the cellars and can’t wait to rummage through their left overs. Thank you for that excellent tip. Oh how lovely! What beautiful towns you visited. And those linens are spectacular!!! I can see that these 2 towns will become regular places to visit. They are lovely towns. I will definitely go back to explore more in better weather. What a great post. I love the fact that the textile business is still viable and operating in Tuscany. Long may they survive! Pleased to see that you found a couple of items to purchase! It was a struggle, but I managed to find a couple of things. Busatti is a beautiful product. Long may it last. i enjoyed both places. 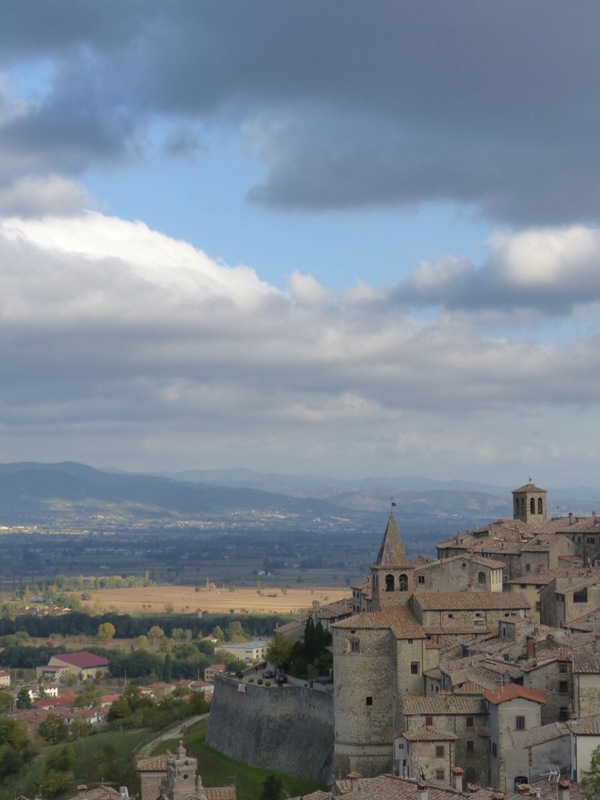 There was a festival going on in Anghiari and various artisans and their workshops open. I will definitely go back to all three places. I love Arezzo and want to exlores the other two a bit more. 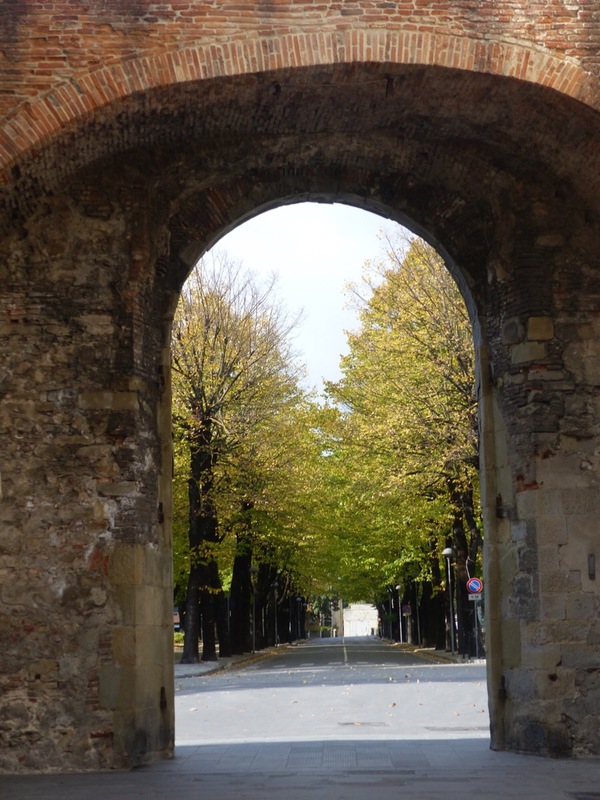 It sounds like Anghiari definitely deserves another visit. So much history in one small town it appears. I find it amazing that each of these towns is so different from the next one. There is alsways so much to discover and enjoy. The whole area needs to be explored.